One more thing: if you want to iterate over every table in all MySQL databases (except information_schema and mysql, I would hope! 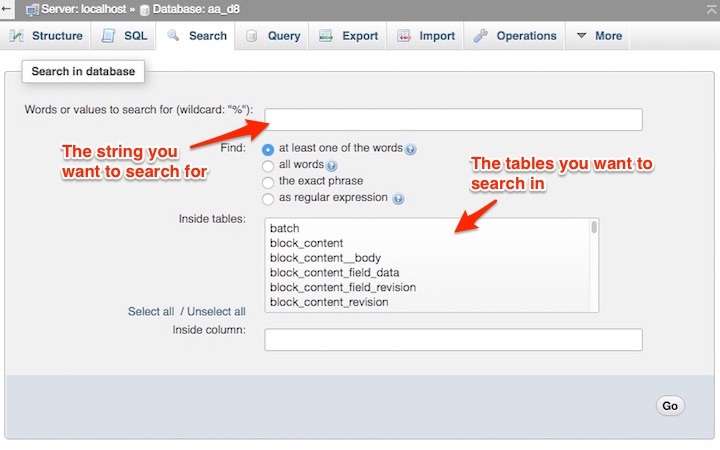 ), substitute the following for the above "database_name1 database_name2":... To delete data in a table, you use the following steps: Connect to the MySQL database by creating a new instance of the PDO object. Construct a DELETE statement to delete a row, multiple rows, or all rows in a table. If you delete all rows in the table with DELETE FROM tbl_name (without a WHERE clause) in autocommit mode, the sequence starts over for all storage engines except InnoDB and MyISAM. There are some exceptions to this behavior for InnoDB tables, as discussed in Section 15.6.1.4, “AUTO_INCREMENT Handling in InnoDB” . If you delete all rows in the table with DELETE FROM tbl_name (without a WHERE clause) in autocommit mode, the sequence starts over for all storage engines except InnoDB and MyISAM. There are some exceptions to this behavior for InnoDB tables, as discussed in Section 14.9.1.4, “AUTO_INCREMENT Handling in InnoDB” .